The Florida Alcohol and Drug Abuse Association (FADAA) and the Florida Department of Children and Families' Office of Substance Abuse and Mental Health (SAMH) together with their partners are continually developing and providing training to personnel who provide substance use disorder services to support the use of evidence-based practices in Florida. This high-caliber training is delivered at no charge to participants via live, in-person workshops and convenient webinars. The archived webinar recordings are not eligible for continuing education units. Participation in interactive webinars and live workshops posted in the Community Calendar does qualify for continuing education for certain Florida licensed health care practitioners and Florida certified behavioral health professionals. Sign up to receive Save the Date notices for upcoming training. Event Description: Consistent engagement is fundamental to successful treatment outcomes. When people are struggling with a substance use disorder, it can lead to avoidant behaviors that are disruptive to care. Treatment providers need to be willing to literally meet people where they’re at to keep their most vulnerable individuals connected to services. The increased presence of case managers and Peer Recovery Support Specialists in treatment programs presents additional opportunities to maintain a connection with individuals. At the same time, incorporating community outreach creates a tool for engaging additional individuals into care or obtaining more accurate feedback following discharge from treatment. This webinar, attendees were invited to consider the ways that community outreach can enhance their program by improving upon intake, retention, and follow-up. This training is supported by the Florida Department of Children and Families Office of Substance Abuse and Mental Health. Event Description: In recent years, the onset of the opioid epidemic in the United States and the significant rise in opioid overdoses has placed a tremendous burden on emergency rooms (ER) and hospitals. This has necessitated the development of new therapeutic and supportive strategies in the health care industry to prevent overdose deaths and to engage individuals with opioid abuse or dependence in treatment. This webinar includes an overview of the opioid epidemic and the efficacious use of medication-assisted treatment (MAT) and “warm-handoffs” in ER settings to reduce subsequent overdoses and deaths. A specific model for the initiation of buprenorphine in an ER setting with continuation of MAT in the community will be presented. This is a recorded webinar produced and provided by SAMHSA and available to watch on YouTube. Event Description: This webinar reviews the relevant historical perspective as well as the most up-to-date local, state and national data as it pertains to the opioid epidemic. There was a brief review of opioid pharmacology, Diagnostic and Statistical Manual-5’s (DSM-5) relevant substance-related disorders and the most common psychiatric conditions that can be confused with or present with substance use was discussed. In addition, the presenter details the major points required to complete a comprehensive co-occurring evaluation in order to yield the best possible diagnoses and treatment plan. Event Description: In this webinar, we update the levels and trends of substance abuse from 2017 to 2018 in Florida, overall and by Managing Entity Regions. Data for this analysis were derived from the following sources: the 2006-2018 Florida Youth Substance Abuse Survey, the 2017 Medical Examiners Report, the 2018 Bureau of Economic and Business Research (population estimates), the Behavioral Risk Factor Survey, the Youth Risk Behavior Survey, and the National Survey on Drug Use and Health. Significant findings of the update include: overall, the rates of substance abuse among adolescents in Florida in the past year remained lower than the national average. The rate of cigarette smoking was low and showed a declining trend, but the rates of use of e-cigarettes and marijuana showed an increasing trend. The rate of underage drinking in Florida, although below the national average, increased slowly with higher rates for females than for males. National data indicate that among adults, the rates of alcohol use (current and binge drinking) and cigarette smoking in Florida were close to the national average, while adult marijuana use in Florida increased more rapidly than the national average in the past year. Data from recent Medical Examiners Reports indicate that the high levels and increasing rate use of opioids (primarily heroin), fentanyl and analogs and morphine slowed down in the past year. Other important findings were increases in detecting and associated deaths with methamphetamine, cocaine, and benzodiazepines in the past year. Event Description: The 2016 National Survey on Drug Use and Health found that over 1.2 million individuals had a diagnosable cocaine or methamphetamine use disorder, with another 540,000 meeting criteria for a stimulant use disorder for prescribed stimulants. Deaths caused by cocaine are climbing at alarming rates in Florida, nearly doubling from 2015 to 2016. This seminar helps participants recognize the impact of stimulant use disorders, as well as increase their capacity to support individuals in their recovery through evidence-supported treatment and health promotion strategies. Event Description: This webinar introduces attendees to the definitional and operational dimensions of cultural competence and culturally competent prevention programming for racial and ethnic minorities. Participants learned the pillars of successfully defining, creating, implementing, and evaluating culturally competent programming for diverse clients dealing with complex substance use and/or mental health conditions. In addition, participants learn how to sustainably and reflexively engage workforces around cultural competence, establishing the philosophical infrastructure needed to maintain an ongoing atmosphere of equity, equality and understanding for all clients. Event Description: Motivational Interviewing (MI) gives clinicians an indispensable tool for facilitating client-centered engagement. By using the core skills of MI, counselors can effectively engage in active listening and build therapeutic relationships with individuals living with a substance use disorder. Trusting relationships create the foundation for lasting, positive behavioral changes. At the same time, change is not always linear and requires that providers help individuals navigate their own ambivalence. Counselors often encounter their individuals’ ambivalence in the form of discord. This training explores the essential components of MI with particular attention on how to recognize resistance and respond in ways that selectively encourage the reasons that individuals believe they can and should change. Event Description: Increasing numbers of women in Florida are reporting opioid use at the time of delivery. As a result, the number of infants at risk of or experiencing neonatal abstinence syndrome (NAS) is also increasing. Medication-assisted treatment (also called pharmacotherapy) is the recommended standard of care for pregnant women with OUD and is considered the best option for healthy fetal development, despite the risk of NAS. The benefits of pharmacotherapy for OUD during pregnancy outweigh the risks of untreated OUD. Pregnant women with OUD should not be encouraged to withdraw from pharmacotherapy for OUD during their pregnancy or after delivery. Withdrawal of pharmacotherapy for OUD and tapering (incremental reduction over time) during pregnancy have a high failure rate, and expectant women with OUD often return to opioid misuse and its attendant risks. With a common understanding of the scope of appropriate pharmacotherapy, clinical treatment, and recovery support for their shared clients, professionals in the medical, judicial, child welfare, behavioral health, and other sectors can more effectively work together to understand and contribute to optimizing outcomes for this vulnerable population. Effective strategies for caring for pregnant and parenting women with OUD and their infants are well-established and increasingly adopted. This webinar reviews effective treatment for OUD in pregnant and parenting women to support long-term recovery and a healthy pregnancy. NAS explains and strategies to minimize and manage its presents. Discusses the role of social determinants of health and the intersection of the opioid epidemic with crises in HIV, hepatitis, and mental health. Event Description: The webinar provides information on the comorbidity of trauma and substance use in adolescents who present for behavioral treatment. Two evidence-based models is presented: Adolescent Community Reinforcement Approach (A-CRA) for substance use disorders and Trauma-Focused CBT (TF-CBT) for trauma. The focus of this presentation provides a framework for understanding and utilizing both models in working with youth. Both models employ a cognitive-behavioral approach. Skills and procedures from each model can be effectively implemented and woven together, with the overarching goal of reducing substance use and trauma symptomology. Event Description: This webinar was built on Florida’s statewide and local ROSC Transformation efforts. Stakeholders report that they are eager to proceed with developing a ROSC but need assistance with operationalizing the concepts. In other words, what do ROSC principles look like in practice? This two-hour session exposes participants to strength-based approaches and language as well as a variety of Recovery Management activities, tasks and tools to use in their organizations and communities. It was designed for those who were unable to attend the one-day ROSC Practical Applications Workshop, this webinar: 1) provides an overview of the workshop activities; 2) highlights and emphasizes objectives from the one-day workshop; 3) shares results and recommendations captured by the workshop “Gallery Walk”; 4) provides an opportunity for participant input; and 5) presents resources and ways to become involved with local ROSC transformation efforts. Presented by: Marci Ronik, M.S. Event Description: First impressions have the potential to impact the course of treatment for individuals with substance use, mental health, and other complex conditions. This webinar provides a dialogue regarding strategies for engagement through the provision of welcoming, person-centered, trauma-informed, culturally relevant, linguistically appropriate, and recovery-oriented services and supports. Participants are introduced to such concepts and provided with tools to assess their own and their organization’s capacity to provide a positive customer service approach. This webinar provides process improvement techniques. Event Description: Harm Reduction was developed from people who use drugs supporting each other to make healthier choices into a service philosophy. This philosophy goes beyond syringe exchange services and prioritizes an individual’s self-assessment in establishing treatment needs, goals, and the strategies they pursue. Harm Reduction Psychotherapy is a client-centered approach that emphasizes the importance of self-identified goals and celebrates incremental progress. Harm Reduction expands upon existing ideas of substance use by incorporating the concepts of Drug, Set, and Setting. This framework promotes assessment and treatment based on a holistic conceptualization of a person who uses drugs by considering the substance they use, biological factors, and their social environment. Based on this framework, Patt Denning and Jeannie Little developed the Multidisciplinary Assessment Profile (MAP) to outline the key dimensions of a person’s life to consider when assisting them with behavior change around their substance use. This webinar defines the principles of Harm Reduction and explores its applications, including the use of assessment as a tool to guide the establishment of self-identified goals and how to achieve them. Event Description: This webinar shares how individuals with opioid use disorders (OUD) often return from institutions and treatment programs to living environments in the community that promote alcohol and other drug use, putting those in early recovery at risk for relapse. Recovery residences are a vital resource for individuals seeking supportive housing environments that promote recovery. While there are currently not enough recovery residences to provide needed post-treatment or re-entry support, this resource is even more scarce for parents with OUD, including those involved in the child welfare system, particularly if they are receiving medication-assisted treatment (MAT). While MAT and recovery residences evolved out of separate communities, recent expansions are occurring in recovery residences that welcome various individuals (including parents in recovery receiving MAT). Event Description: Medication Assisted Treatment is a critical component of the Opioid Epidemic. This presentation addresses through research and real- world experiences how to engage and retain clients through the use of methadone, buprenorphine, and naltrexone. Finally, it addresses ways to reduce administrative discharge. Event Description: This addresses the Impact of Synthetic Drugs is a session designed to provide an overview of the history of synthetic drugs and their resurgence in the United States. Participants look at the issues through the lens of prevention, and looks at how to apply the strategic prevention framework at the local, community level to identify drug trends and engage key community sectors to identify strategies to reduce and prevent the impact of synthetic drugs and other substances. Presented by: Jamie Mulligan, Psy.D. Event Description: This webinar reviews the transition from the traditional model of care to a family-focused approach, why this transition is necessary, and steps you can take to shift to a more collaborative relationship with families as they learn to guide their own care. Event Description: Over 80% of inmates in the county and state system have substance use disorder; yet, evidence-based treatment is not provided. This webinar will focus on the missed opportunity of treating addiction within a correctional facility. Event Description: Individuals who have experienced ongoing, interpersonal trauma are at an increased risk of developing substance use disorders. The experience of chronic exposure to trauma disrupts emotional self-regulation capacities, skews patterns of attachment, and impairs individuals’ ability to discern safety from danger. With a lack of adequate caregiving, individuals may use substances to manage traumatic symptoms and situations. Experiencing repeated traumatic events and engaging in substance use to cope can compound the neuropsychological effects of each. Complex trauma is a risk factor for substance use disorders; at the same time, an unhealthy relationship with drugs or alcohol increases the likelihood of re-traumatization and often exacerbates the impact of traumatic events. This webinar will explore the cyclical relationship between complex trauma and substance use disorders, including administrative considerations and clinical implications. Event Description: This training introduced attendees to the fundamental aspects of motivational interviewing and coach them on clinical skills. In addition to some didactic material, this training will focus on experiential learning that provides time for direct practice of the core skills and application of the motivational interviewing spirit. Event Description: The fields of Substance Use Disorder Treatment and Recovery are traditionally separated by distinct philosophies, funding mechanisms, and physical spaces. Efforts to build outcomes-driven, Recovery-Oriented Systems of Care in our communities are emboldened by the emergence and integration of Peer Recovery Support Services (PRSS), and by lessons drawn from recovery research. Join PRSS systems specialist Dean LeMire of the National Recovery Institute for an interactive webinar investigating the roles of clients, their peers, and recovery management strategies in improving treatment and recovery outcomes. Event Description: The Florida State Foster/Adoptive Parent Association tells us that more than 251,000 children in Florida are raised by grandparents, aunts, uncles, siblings, other extended family and close family friends who step forward to care for them when parents are unable. Although data is limited, research shows parental substance use is the most common reason these grandfamilies come together to raise children who would otherwise go into foster care. With the rise in heroin and other opioid use, more relatives are raising children because the parents have died, are incarcerated, are using drugs, are in treatment or are otherwise unable to take care of their children. This webinar will explore the opioid epidemic’s impact on kinship care in Florida, discuss their unique challenges, and identify important supports and local resources. Presented by: Jaime Houston-Mulligan, Psy.D. Event Description: Tobacco use amongst teens has been on the decline while the use of vaporizers and e-cigarettes has increased rapidly in recent years with prevalence of e-cigarette use higher than prevalence of any tobacco product, including traditional cigarettes. The popularity of e-cigarettes and vaping is of concern because of the misconception that these products are “safe”, and the lack of information of the long-term effects of vaping on teen health and development. In this webinar we will review vaping and current data on use and misuse, ways in which adolescents use and abuse these products and the impact of use on their health. We will also cover current prevention efforts and emerging tools to help prevent vaping. Event Description: LGBTQ+ individuals experience increased rates of interpersonal violence, adverse health outcomes, rates of substance use disorders, and mental health difficulties, including increased rates of suicide. At the same time, LGBTQ individuals experience significant barriers in accessing affirming and responsive behavioral health and recovery support services. This workshop will help participants to realize the impact of trauma for LGBTQ+ individuals, as well as identify organizational and clinical practices to prevent retraumatization within systems of care. Event Description: We live in a society where millions of Americans are dependent on drugs or alcohol and only a small percentage receive treatment at a facility. In fact, the 2014 National Survey on Drug Use and Health found that 21.5 Americans age 12 and older had a substance use disorder in the previous year; however, sadly only 2.5 million received the specialized treatment they needed. Stigma affects all of us – and nearly everyone has felt stigmatized or has stigmatized others at some point in their lives. In a study done by Johns Hopkins Bloomberg School of Public Health, the general public was more likely to have negative attitudes towards those dealing with drug addiction than those who were dealing with mental illness. Additionally, researchers found that people don’t generally support insurance, housing, and employment policies that benefited people who were dependent on drugs (JHU, 2014). This webinar will include the power of changing language, understanding the science of substance use disorder and recovery, and simple action steps to help make a difference on an individual or community level. Presented by: Julie Radlauer-Doerfler, M.S. Event Description: The Florida Department of Children and Families has made a commitment to the transformation of the behavioral health system with initiatives such as Recovery Oriented Systems of Care, Children’s System of Care and High-Fidelity Wrapround. These statewide initiatives capitalize on the existing resources in our system and provides support, structure and an evidence base behind enhancing practices. This training will provide an overview of the transformation from typical case management services to the implementation of High Fidelity Wraparound statewide. Participants will learn about the Wraparound process and how they can enhance their current case management practices to align with the statewide Wrapround movement. Event Description: Adverse childhood experiences (ACEs) are stressful or traumatic events, including abuse and neglect. They are a significant risk factor for substance use disorders and can impact prevention efforts. ACEs may also include household challenges such as witnessing domestic violence or growing up with family members who have substance use disorders. This presentation will look at preventing ACEs and engaging in early identification of people who have experienced them which could have a significant impact on a range of critical health problems. We will look at the history and overview of ACEs and will explore how this framework can inform our work in substance abuse prevention. Event Description: This webinar will provide an overview of the Adolescent Community Reinforcement Approach (A-CRA) model. This is an evidence-based model used with adolescents and young adults with substance use disorders and/or co-occurring substance use/mental health disorders. A-CRA has been widely researched and disseminated across many sites in the United States and abroad since the mid-1990s. Several key research studies will be highlighted. Additionally, participants will learn about the objective of A-CRA, the guiding principles of A-CRA, and review several A-CRA procedures. The A-CRA training and certification process will be reviewed and highlighted. Event Description: This webinar will describe the common profiles of adolescents presenting for treatment, review the impact of substance use on adolescent development and discuss evidence-based treatments and guidelines for adolescents with substance use disorders. A case example will be used to demonstrate different approaches to treatment. The research evidence behind effective and cost-effective treatment for adolescents with substance use disorders will also be reviewed. This webinar is intended to help both experienced and novice practitioners develop knowledge and skills to work more effectively with adolescents with substance use disorders. Event Description: This webinar will provide a brief statewide and regional update of the data and trends most recently addressed in the 2018 Annual Report, Patterns and Trends of Substance Use Within and Across the Regions of Florida. This update includes new information from sources such as the Monitoring the Future 2017 Overview and the 2017 Interim Report from Florida’s Medical Examiners Commission. Major findings include: historic declines in alcohol use, binge drinking and cigarette smoking among Florida’s youth; the serious and growing harm caused by opioids, especially heroin, fentanyl and fentanyl analogs, and increased mortality associated with cocaine, methamphetamine and alprazolam. Event Description: Clearly, attitudes toward marijuana use have shifted from those of decades past, and prevalence of use in the U.S. has increased over time. In 2016, it was estimated that 128 million Americans had tried cannabis, of which 24 million were current (i.e., past month) users, making cannabis the most commonly used drug among for those age 12 and older (Substance Abuse and Mental Services Administration [SAMHSA], 2017). These data underline the importance of reexamining the current approach and adopting new, more effective means of discussing cannabis use with youth and adults. In this webinar, presenters will provide highly relevant new information to better engage youth and adults regarding cannabis use and targeted motivational intervention strategies with proven tools to motivate change. Workshop - Implementing Effective Prevention Strategies in the Face of a Changing Environment. Event Description: The landscape related to substance use is changing. States are legalizing marijuana, and the opioid epidemic is Florida’s most urgent public health issue despite enhanced efforts to address the crisis. With communities working to reduce overdose death and increase pathways to treatment, where does primary prevention fit? This session will provide an overview of how and why primary prevention should be the foundation of any substance abuse effort. We will look at emerging trends and the role that community coalitions play in addressing community level risk factors that lead to youth substance use. Participants will be engaged in a dialogue related to the importance of mobilizing the community using SAMHSA’s Strategic Prevention Framework (SPF) and will have the opportunity to identify how they can apply concepts from this session in their work. Event Description: The purpose of this webinar is to learn the basics for increasing community recovery capital within a Recovery Oriented System of Care (ROSC). Event Description: The FDA approved intramuscular Extended-Release Naltrexone (XR-NTX) for the prevention of relapse in opioid use disorder (OUD) following detoxification. XR-NTX is different from previous Medications in Addiction Treatment (MAT) in terms of abstinence & blockade, duration of action, psychological effects, and impact on behavior. We will review XR-NTX’s pharmacology, clinical indication, formulation, patient selection issues, patient initiation protocols, counseling approaches, contraindications, adverse effects, and considerations regarding treatment completion. Event Description: Although the opioid epidemic is killing a broad swath of Americans, there are important subgroups who are at even greater risk. Their vulnerability and specific needs deserve particular attention. Medication in addiction treatment selection and delivery must be considered in light of these epidemiologic, biological and other clinical parameters. Focused attention to outreach, wrap-around services and collaborative care can save lives and build recovery and health for these patients, their communities, and society as a whole. This education experience was offered as a live workshop. Event Description: This webinar will focus on evidence-supported strategies to engage and support families in recovery, including methods to improve communication and problem solving within the family, family psychoeducation, and family intervention models with special emphasis on Community Reinforcement and Family Training (CRAFT) Therapy. Event Description: For many, recovery is a lifelong process, and yet we know that recovery is possible. Rooted in SAMHSA’s guiding principles of recovery, with emphasis on relationship-based, trauma-informed, person-centered and strengths-based approaches; this workshop will offer hands-on learning to implementing evidence supported practices in substance use counseling with key skills for assessing opioid overdose risk and providing overdose prevention counseling. Event Description: This webinar will include an overview of trauma basics and its pervasiveness in all age groups and in special populations. The webinar will describe developmental milestones and how those are associated with gender differences in responses to trauma. Also, the webinar will include information about how the Adverse Childhood Experiences Study reflects gender differences. The webinar will be appropriate for new as well as experienced clinicians, and it will teach participants that healing and recovery from trauma are possible. Event Description: Although research supports the efficacy of Contingency Management (CM) as an evidence-based practice for treatment of substance use disorders, it is not widely used. This webinar will review the theory of CM and its origins in operant conditioning, its evidence base of 40 random controlled trials, and current understandings of best practices for effective use of CM – including what is not fully known. We will also examine the logistical, financial, ethical and training obstacles that have impeded adoption of CM and the ways in which new technologies may solve these challenges to facilitate widespread adoption of CM into routine clinical care. Event Description: Oral naltrexone (NTX-PO) is a potent blocker at brain opioid receptors, so it was a natural consideration as a medication in addiction treatment (MAT) for Opioid Use Disorder (OUD). For most OUD patients, however, studies have not found NTX-PO to be any better than placebo or non-medication treatment – due to poor adherence by patients. Nevertheless, it is still used for patients whose pill-taking can be regularly monitored, for detoxification and induction onto extended-release naltrexone, and for patients who have completed MAT but encounter new stressors for which they may want temporary protection from relapse. Event Description: Through brief lecture, demonstration, and case consultation this training will focus on experiential learning to support workers’ skills and competence in utilizing clinical interventions. The trainer will guide, facilitate, oversee, and process experiential learning activities to ensure accurate practice, appropriate feedback, and incorporation of new skills into every day work. Event Description: Women receiving treatment for substance use disorders need a comprehensive approach to treatment that addresses their physical, mental, social and spiritual aspects of life. This webinar will provide research findings regarding the biopsychosocial issues that women with substance use disorders often face. It also will provide clinical tips to help women heal and thrive. It will include information about how trauma can shape parenting practices and how providers can help nurture maternal-child interactions to be more positive. The webinar will conclude with describing ways to help women live in whole health wellness in a lifespan and recovery-oriented approach. Event Description: Dr. Gastfriend is Senior Research Scientist at the Treatment Research Institute (TRI). This training is relevant to a variety of health and human service professionals and paraprofessionals, such as health care professionals (physicians, pharmacists, nurses, emergency medical personnel, etc. ), law enforcement, mental health and addiction professionals, behavioral health technicians, recovery support personnel, and community members at risk of experiencing or witnessing an opioid overdose. Event Description: Clinical supervision is “the cornerstone of quality improvement and assurance” in the addiction field, providing, “a bridge between the classroom and clinic” (Substance Abuse and Mental Health Administration 2009). Clinical supervisors are gatekeepers for their profession. Their ability to mentor, educate, and encourage their supervisees is an important determinant of the quality of treatment given to individuals with substance use disorders. Guidance from skilled supervisors helps clinicians achieve more competence, confidence, and knowledge. This webinar will describe how to be an effective clinical supervisor in the substance abuse treatment field. It will include information about: Clinical supervision’s role in substance abuse treatment; ethical and legal considerations of clinical supervision, and supervision issues involved in implementing Recovery Oriented Systems of Care practices. The information will be useful for new as well as experienced clinical supervisors. Presented By: Lee A. Crandall, Ph.D. Event Description: This webinar will review the most current trends from 2016 and 2017 in tracking substance abuse with Florida's 7 Managing Entity Regions and across the State. It builds on reports previously produced by Epidemiologist James N. Hall to describe the use and impact of drugs in Florida. It includes the: 2017 Florida Youth Substance Abuse Survey data published in November 2016; 2016 Medical Examiners Report published November 2017 and the Bureau of Economic and Business Research 2017 county population estimates published December 2017. It also includes information from the: Behavioral Risk Factor Surveillance System; Youth Risk Behavior Surveillance System; Florida Youth Tobacco Survey and National Survey on Drug Use and Health. Major findings include: A continuing improvement in indicators of youth use of alcohol and cigarettes; serious and growing harm caused by opioids, especially heroin, fentanyl and fentanyl analogs, and increased mortality associated with cocaine, methamphetamine, and alprazolam. Event Description: Traumatic events are powerful and influential moments in people’s lives. While individual responses to trauma can vary, they share a common function of allowing for survival and adaptation. Learned behaviors can either serve as a means of protection against retraumatization or lead to further isolation and victimization. By incorporating trauma-informed care into the delivery of services to adolescents, providers are better equipped to provide early intervention, avoid retraumatization, and foster post-traumatic growth. This webinar will focus on implementing a strengths-based approach to understanding traumatic events and their effects. Attendees will learn about skills, supports, and clinical interventions for providing trauma-informed services to adolescent populations. Event Description: Recovery Oriented Systems of Care (ROSC) principles challenge behavioral health professionals to move beyond narrow, problem-driven models of service delivery to more fully embrace strengths-based, recovery-focused care. This transformation includes the design, delivery, and evaluation of behavioral health services. Words used to describe individuals’ lives and recovery also are part of ROSC. Often behavioral health field language is contrary to clinicians’ strengths-based, recovery-focused intent. There is a tendency to focus on deficits, aberrations, and symptoms—what is “wrong” with people. Emphasizing the negative has led to hopelessness and despair among people in recovery and the behavioral health professionals who serve them. By contrast, recovery-oriented practitioners strive to communicate in respectful, balanced ways celebrating strengths while not minimizing barriers interfering with a person’s life, goals, and aspirations. This webinar will review guidelines that should be considered regarding recovery-based language in written documents and verbal interactions. This webinar will include experiential exercises and examples of "transformed" language excerpts and terms. Participants also will learn about references and resources. Event Description: This workshop is relevant to a variety of health and human service professionals and paraprofessionals, such as health care professionals (physicians, pharmacists, nurses, emergency medical peronnel, etc. ), law enforcement, mental health and addiction professionals, behavioral health technicians, recovery support personnel, and community members at risk of experiencing or witnessing an opioid overdose. Event Description: A person-centered approach supports individuals in driving their own recovery and encourages a holistic method of collaborative planning. It goes beyond the management of diagnosis. It allows clinicians to more fully appreciate the importance of an individual’s cultural preferences, natural supports, and recovery-based life goals. This webinar will provide an overview of the core principles and practices of strengths-based, person-centered recovery planning (PCRP), and how it differs from traditional approaches to care. The webinar will focus on a didactic presentation of the PCRP model with an emphasis on the “nuts-and-bolts” of quality implementation from both a process and a documentation perspective. Participants will receive guidance in co-creating recovery plans that respect strengths-based, person-centered principles while also satisfying expectations associated with clinical, accreditation, and fiscal regulations. Hypothetical, case-based examples of strengths-based PCRPs will be shared with the group as a way of illustrating key elements of quality recovery plans. Participants will also be given access to resources to support further learning and skill development in Person-Centered Recovery Planning. Event Description: This webinar will provide information about excessive alcohol use in Florida and will focus on environmental strategies to reduce underage drinking and adult binge drinking. It will include information about: environmental factors that encourage excessive alcohol use; best practices in terms of environmental strategies to address excessive alcohol use; and the research supporting those best practices. The webinar will include case study examples demonstrating how the research findings can be used. The webinar will contain information that would be useful for newcomers to prevention as well as highly experienced persons working in the prevention field. Event Description: Increased prescription drug and heroin use and addiction have led to an opioid epidemic in the United States. Medication Assisted Treatment (MAT) is an evidence-based practice that can be an important tool in helping people recover from substance use disorders. This webinar will review best practices for utilizing Vivitrol®, a non-narcotic, non-addictive MAT in jails and with individuals transitioning into the community after incarceration. Event Description: In this skill-building webinar participants will be introduced to strategies to effectively work with clients with co-occurring disorders to address their needs on their road to recovery. Mental health issues and substance use disorders co-occur in about 45% of Americans seeking substance use disorder treatment (SAMHSA). Co-occurring disorders can be difficult to diagnose due to the complexity of symptoms. In many cases, people receive treatment for one while the other remains untreated. This may occur because both mental and substance use disorders can have biological, psychological, and social components. Other reasons may be inadequate provider training or screening, an overlap of symptoms, or that other health issues take priority. In any case, the consequences of undiagnosed, untreated or undertreated co-occurring disorders can lead to a higher likelihood of experiencing homelessness, incarceration, medical illnesses, suicide or even early death. A partial list of topics included in this webinar is: the new person-centered approach to co-occurring disorders treatment; evidence-based approaches to co-occurring disorders treatment; and 10 strategies for helping clients with co-occurring disorders avoid slipping through the cracks. Event Description: People who inject drugs are at greater risk of contracting or transmitting HIV and viral hepatitis. The intersection of the opioid and infectious disease epidemics is not a coincidence. Stigma and discrimination against people with mental health or substance use disorders or HIV can deter individuals from seeking health care services, reducing the opportunity for better health through the use of the latest methods for treatment and prevention. This webinar will present information/trends about the inter-relationship between opioid misuse and infectious disease and what measures can be taken to effectively address this public health emergency. Evidence-based behavioral interventions and innovative approaches to infectious disease prevention for persons who inject drugs will be discussed. Event Description: One in five individuals experiencing homelessness in January 2016 was also living with a serious mental health or chronic substance abuse disorder (2016 AHAR: Part1-Point-In-Time Estimates of Homelessness in the U.S.). Individuals living with mental health and/or substance use disorders can be particularly vulnerable to becoming homeless as these health conditions can create difficulties in accessing and maintaining stable housing. Coping with the trauma of homelessness can further exacerbate substance use/abuse and mental health conditions. Traditionally, homeless and housing programs have required sobriety and/or mental health treatment as a prerequisite to receiving housing and services. Similarly, behavioral health providers often consider treatment for behavioral health issues as the first order of business for those experiencing homelessness. However, a large body of evidence-based research demonstrates that these practices may create barriers to, and lack of involvement with, systems of care, causing the most vulnerable people to fall through the cracks. When providers focus on stabilizing an individual’s most basic needs first, such as permanent affordable housing, the likelihood of recovery is significantly improved. Substance abuse and mental health recovery are much more attainable when individuals have stable housing. This webinar, designed for novice as well as advanced practitioners, will provide best practices for addressing homelessness for individuals involved in the behavioral health system and present steps for how behavioral health providers can assist with housing needs. Participants will receive tools to increase skills for effectively working with individuals pre-housing and post-housing. Event Description: The FDA approved Buprenorphine (BUP) in addiction treatment as safe and effective for opioid use disorder (OUD). BUP has unique chemistry, brain effects, side effects, and impact on behavior. We will review BUP’s pharmacology, clinical indication, formulations, federal law requirements, patient selection issues, practice guidelines, counseling recommendations, contraindications, adverse effects, abuse risks and considerations regarding treatment completion. Event Description: Historically, women with substance use disorders have received treatment that was developed to meet the needs of men with substance use disorders. However, research during recent decades has indicated that women with substance use disorders benefit from receiving holistic, women-centered approaches that meet their psychosocial needs (Substance Use and Mental Health Services Administration, 2009). This particularly is important for pregnant and parenting women with substance use disorders, a subgroup that – due to their specialized stresses and responsibilities – can be difficult to attract to treatment and to retain in treatment. Using examples from cases, this webinar will describe how to use the initial intake and assessment of such pregnant and parenting women to maximize their chances of successfully completing treatment. 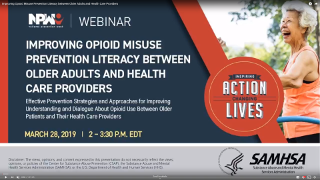 Event Description: This webinar is intended for substance use treatment providers, primary care clinicians, social workers, senior center staff and others who have regular contact with older adults. The purpose of this webinar is to better understand the life transitions that occur with aging that may cause older adults to be at risk for problems with substance use and present information about relevant trends and tools for successfully recognizing, screening, and treating substance use in older adults. Participants will also explore their own possible biases towards screening and treating older adults who may be misusing or abusing substances. Event Description: The purpose of this webinar is to learn about the Evidenced-Based Practice Dialectical Behavior Therapy (DBT). DBT is a highly efficacious treatment developed by Marsha M. Linehan, PhD, for multi-diagnostic, severely disordered individuals with pervasive emotion dysregulation. While originally developed for difficult-to-treat patients with borderline personality disorder (BPD), research has demonstrated that DBT is also effective for patients with a variety of complex problems, including substance use disorders where emotion dyscontrol are often at the core of the individual’s problems and/or interfere with long-term maintenance of therapeutic progress (Chapman, 2006), DBT has been adapted for use in a variety of settings, including prisons, inpatient hospitals, schools, and juvenile justice facilities. Event Description: The opioid epidemic has taken a dramatic shift in its impact upon every socioeconomic level of our society. Beginning with prescription opioids to fentanyl and its analogs, we are now facing unfathomable challenges. Knowing not only whom but also what we are treating has become of paramount importance. Without drug testing, treatment will be a partially blind effort that can result in further morbidity and mortality for individuals with substance use disorders. This webinar will review the basic pharmacology of the most common drugs of abuse as well as their interaction with each other. We will then discuss the various forms of drug testing available while also analyzing the benefits and potential pitfalls of each type of testing. In addition, how to best understand and utilize drug testing results as potential therapeutic interventions will be clearly delineated. Most importantly, the potentially lifesaving benefits of drug testing, within the scope of substance abuse treatment, will be analyzed and discussed. Presented by: Kimberly McGrath, Psy.D. Event Description: This workshop addressed Commercially Sexually Exploited Children (CSEC). This issue has been in the forefront of child welfare for the past several years. In response, the Florida Legislature has approved legislation and rules to help guide the child welfare system, professionals and providers engaged with and who treat survivors of exploitation. Through this presentation participants will acquire an understanding of the scope of the problem of commercial sexual exploitation and the related importance of awareness of CSEC. Event Description: Participants reviewed how our understanding of the brain and clinical research elucidate strategies for patient management, specifically for patients receiving medication-assisted treatment. These strategies can improve patient engagement, retention, adherence to counseling and medication, support from families/significant others, completion of therapy, and continuity of care. Event Description: This webinar will explain why and how to implement the Self-Assessment Planning Tool for Implementing Recovery-Oriented Mental Health Services (SAPT) Version 2.0. The tool was originally developed at the University of South Florida under contract with the Florida Agency for Health Care Administration (AHCA). In 2016, the SAPT planning tool was revised to support Florida’s Recovery-Oriented System of Care (ROSC) process. A ROSC is a system transformation initiative that the Florida Department of Children and Families (DCF) is leading. This is a values-driven approach to structuring behavioral health systems and a network of clinical and non-clinical services and supports. Under ROSC, recovery is expected and achieved through meaningful partnerships and shared decision making with individuals, communities, and systems. The planning tool is designed to help agencies establish policies and practices resulting in positive, recovery-oriented services outcomes. Event Description: Participants will learn how to effectively engage print media in publicizing substance abuse prevention efforts. They also will learn how to effectively engage broadcast media professionals in publicizing substance abuse prevention efforts, and how to effectively use social media in substance abuse prevention efforts. Event Description: In recent years, unintentional overdose surpassed car accidents as the leading cause of unintentional injury death in the United States. The Centers for Disease Control and Prevention stated that the United States is experiencing an “epidemic of drug overdose (poisoning) deaths,” citing that since 2000, the rate of drug overdose deaths increased 137%, including a 200% increase in those involving opioids. In Florida, drug-related deaths increased by 14% from 2014 to 2015, with deaths from opioids (heroin, fentanyl, methadone, morphine, and oxycodone) determined as causing death in more than 50% of the 4,682 deaths in which drugs were found (Florida Medical Examiners Commission Report, April 2016). Given these numbers, law enforcement, other first responders and human service professionals of all types face the ever-growing reality of having to deal with drug overdoses on any given day. The purpose of this webinar is to examine the use of naloxone, a well-known and long used medication to reverse effects of opiates in the event of overdose. Step-by-step instructions for recognizing and responding to an opioid overdose will be presented. This session will also provide detailed information regarding Florida’s 911 Good Samaritan and Naloxone Access laws. Instructions for enrolling in DCF’s Overdose Prevention Program will be provided to non-profit organizations interested in receiving free naloxone to distribute to individuals at risk of experiencing an opioid overdose. Event Description: This webinar will include a review of current literature on adherence and treatment compliance in the treatment of substance use disorder. It will provide the current knowledge base for treatment duration for the three most commonly prescribed medications used in MAT focusing on XR-NTX (Vivitrol). A draft protocol for assessing treatment completion designed for the entire provider team including prescribers, individual and group counselors, coaches, and other team members will be presented. Event Description: This two-hour best practice webinar addresses outreach efforts for pregnant women with substance use disorders, intravenous drug users and individuals meeting criteria for care coordination. To be effective, programs must successfully recruit, retain, and engage these individuals. Recruitment activities involve enrolling individuals in services and retention activities keep them coming back. This webinar provides information on how agencies can identify issues or problems with recruitment and retention how to improve the effectiveness and efficiency of these critical processes in their own operation. The presenter will share lessons learned along with practical advice on how to implement an effective recruitment and retention strategy. Event Description: This webinar will identify the SAPT block grant-required policies and procedures that specifically apply to pregnant and parenting women. Participants will learn how to create policies and procedures ensuring providers’ correct implementation of those requirements. Participants also will learn to efficiently document in clients’ files those SAPT block grant-required services. Event Description: This webinar is a complete overview of the VIVITROL program managed by FADAA. Beginning with the application process and provider registration through requesting payment and submitting required data – all topics needed to participate in the program will be covered. Participants will be provided step-by-step guidance on the VIVITROL program including patient eligibility, program goals, clinical resources, and database issues. The differences in the DCF funded program and the OSCA program will be explained including provider and patient eligibility, reporting, and submitting payment requests. Upcoming additions to the provider portal will be explained. There will be an opportunity for participants to ask questions and during the presentation. Event Description: This two-hour best practice webinar presents strategies for increasing treatment completion rates and retaining pregnant women with substance use disorders in treatment. Treatment retention is one of the most consistent predictors of positive treatment outcomes so it is critical that pregnant women engage and stay in treatment. This webinar will help participants identify factors that influence retention among women, such as socio-demographics including age, education, race/ethnicity, economics, and partner relationships; criminal justice and child protective services involvement; pregnancy; and co-occurring disorders. Research indicates that women benefit from a supportive, safe, and nurturing treatment environment that promotes a mutually respectful, empathic and compassionate therapeutic relationship. This webinar presents information about the collaborative treatment approach and priority treatment goals for pregnant women with substance use disorders for successful engagement and establishing a sense of trust. Event Description: The Florida Legislature has made substantive changes to Level 2 background screening requirements which include: 1) a clearinghouse for background screening and rescreening and 2) new crimes added to the list of disqualifying offenses. In this webinar, an overview of the current background screening process and how the law is applied, as changes to background screening in 2015. The process to apply for exemption from disqualification and understanding the exemption process will be discussed. Event Description: This webinar will provide an overview of the Level of Care Utilization System for Psychiatric and Addiction Services (LOCUS 2010) and the Child and Adolescent Level of Care Utilization System (CALOCUS 2010) that were developed by members of the American Association of Community Psychiatrists and the American Academy of Child and Adolescent Psychiatry. This webinar will review the underlying philosophy and principles of those instruments. It also will highlight some of their differences. It will describe the level of care continuum, the Dimensions and criteria rating system, and the method to determine a level of care recommendation. In addition, it will discuss key concepts to use completing these instrument(s). Event Description: The goal of this Webinar is to review the most current trends within Florida’s 7 Managing Entity Regions and across the State. Underage drinking and tobacco use continues to decline and reflects significant progress of Florida’s prevention strategies. However, adolescent marijuana use has stabilized at high rates and now involves higher potency cannabis products as well as more intense methods of administration. Methamphetamine deaths are increasing as the drug appears to be more available in the Tampa area as well as the northern Panhandle and Orlando areas. Prescription opioid abuse has been the breeding ground for the growing number of heroin users in Florida and across the nation. Increased use of poisonous fentanyl analogues from clandestine labs as a substitute or adulterant for street heroin has escalated opiate deaths. Rising indicators of cocaine abuse is attributed to its use by opiate addicts and doubling of its production in Colombia. Changing patterns of synthetic cathinone stimulants including "Flakka" or "Mollys" and other Novel Psychoactive Substances are in part linked to a ban by China in late 2015. Event Description: Motivational interviewing focuses on the present, and involves working with a client to access motivation to change a particular behavior that is not consistent with a client's personal value or goal. Motivational interviewing is conducted without judgment, confrontation and is not adversarial. The approach seeks to increase the client's awareness of the potential problems caused, consequences experienced, and risks faced as a result of the behavior in question. Alternatively, or in addition, therapists may help clients envision a better future, and become increasingly motivated to achieve it. The strategy seeks to help clients think differently about their behavior and ultimately to consider what might be gained through change. Event Description: Health information is private and should be protected. That is why there is a federal law that sets rules for health care providers and health insurance companies about who can look at and receive our health information. This law, called the Health Insurance Portability and Accountability Act of 1996 (HIPAA), gives you rights over your health information, including the right to get a copy of your information, make sure it is correct, and know who has seen it. Event Description: Interagency community collaboration practices facilitate involvement of between community organizations and agencies. They should include interagency agreements that articulate roles, responsibilities, communications, and other strategies to foster collaboration and enhance positive outcomes. This collaboration can occur on multiple levels, from frontline collaboration among caseworkers, families, mental health providers, teachers, and others, to collaborative relationships between policy-makers and administrators responsible for addressing organizational mandates, financing, and management. Event Description: Multidimensional Family Therapy (MDFT) improves adolescents’ and their families’ lives by intervening in four connected areas: the adolescent, the parents, the family, and the community. Just as problems overlap, MDFT uses changes in each of these areas to stimulate changes in all the others. Sessions can be conducted from one to several times per week over the course of three to six months in the home or counseling office. NREPP, a system of the Substance Abuse and Mental Health Services Administration, gave MDFT an evidence-quality rating of 3.8 out of 4 for recovery from substance use, and 3.6 out of 4 for delinquency. The overall rating for readiness for dissemination (e.g., quality of implementation materials and support) was 3.6. MDFT was also one of just five interventions chosen for NREPP's Comparative Effectiveness Research Series, as well as the only adolescent intervention chosen. The Comparative Effectiveness Series promotes the adoption of mental health and substance abuse interventions that have been evaluated positively by NREPP. Event Description: This webinar is intended to introduce participants to environmental strategies, and the use of community based prevention approaches, to reduce the use of alcohol, tobacco and other drug use. The webinar will provide participants with an overview of environmental strategies, with a focus on evaluation processes. Participants will be invited to an interactive discussion on the use of environmental approaches in their community to identify challenges and potential solutions. Event Description: Moral Reconation Therapy (MRT), an NREPP program, is the premiere cognitive-behavioral program for substance abuse treatment and offender populations. Developed in 1985 by Dr. Kenneth Robinson, and Dr. Gregory Little, nearly 200 published outcome studies have documented that MRT-treated offenders show significantly lower recidivism for periods as long as 20 years after treatment. Event Description: Peer Mentors are part of a team of individuals who work closely with substance abuse treatment and prevention agencies, mental health agencies, and managing entities to guide them to build capacity to implement continuous quality improvement strategies including implementing evidence-based practice tools with fidelity. In this web meeting, participants will: review the SAPT Block Grant requirements; discuss how to solicit information using motivational interviewing techniques; identify best practices for conducting EBP fidelity site visits; and participate in case studies. Event Description: More than 50% of Medicaid spending is on approximately 5% of beneficiaries, particularly those with serious physical and behavioral health needs. This webinar will outline national and state level policy and reimbursement models to improve transitions of care to decrease hospital re-admission rates for people with behavioral health disorders. Additionally, participants will learn about evidence-based care transitions and care coordination models and how they may apply these concepts to their organizational practice. Event Description: Lesbian, gay, bisexual, and transgender individuals still face discrimination and prejudice in society. Professionals are called to affirm clients’ ability to integrate their sexual orientation and gender identity in healthy ways into their personal recovery, as well as support LGBT-inclusivity in the larger community. This webinar provides information and strategies designed to promote the provision of culturally competent and appropriate addiction treatment to LBGT individuals. It will review knowledge, skills and best practices that have been identified as being effective in providing LGBT affirmative services. It also will be an opportunity for participants to e-discuss case studies. Event Description: The third edition of the American Society of Addiction Medicine’s criteria was released October, 2013: “The ASAM Criteria – Treatment Criteria for Addictive, Substance-Related, and Co-Occurring Conditions.” This webinar will review the underlying concepts and the six dimensions and multiple levels of care of The ASAM Criteria. The focus will be on improving clinical and systems application of The ASAM Criteria. The webinar will explain what using The ASAM Criteria really means; and increase understanding in applying the ASAM Criteria multidimensional assessment in individualized treatment. To truly implement the spirit and content of the Criteria, systems changes are needed and will be discussed. Event Description: An evidence-based practice (EBP) is a practice that has been validated and supported by scientific evidence. The intent is that service delivery is based on new advances in research and science ensuring that the services being provided are the most appropriate for the individual and are the best possible from the perspective of effectiveness. The use of “evidence based” as a standard of practice in health care, behavioral healthcare, social work and corrections programs has gained recognition since the mid-1980s. The goal of this movement is to invest in what works in an effort to demonstrate more positive outcomes and more efficient utilization of limited community resources. This webinar is designed to help agencies and clinicians to choose EBPs that are most suitable for meeting their clients’ treatment and prevention needs. The webinar also is designed to assist agencies and clinicians in effectively implementing their EBPs. Event Description: This webinar will highlight the importance of your agencies first point of contact. As the first point of contact, you will field the client or potential client questions: answering the phone, scheduling appointments, verifying insurance, giving directions; problem solving, etc. This is the “Golden Opportunity” to build rapport with the client or potential client if handled correctly. Your tone, knowledge, and genuine concern for the client, play a vital role when interacting with the client. Additionally, being trained to handle most clients’ issues streamlines the process for both the client and the agency. Learn strategies to polish your image, engage customers and increase the success of your agency. Event Description: This is a critical time in our field. Behavioral health providers are navigating changing reimbursements structures, increased data demands, and new healthcare models that increasingly emphasize things like service and community integration, person-centered approaches, care coordination and improved outcomes. From the provider perspective, many of these changes are occurring in the context of what seem to be shrinking resources making concerns about sustainability paramount for many. While the current healthcare environment seems to present numerous challenges, it also offers amazing opportunities to re-orient your service delivery approach, to become more innovative, resourceful, and effective. Key to addressing the current challenges is expanding our approaches beyond traditional medical models which revolve around biopsychosocial stabilization, to using recovery-oriented, evidence informed practices that help people to sustain their wellness in the context of their communities. Equipped with the right information, resources and skills, treatment providers can position themselves to thrive. This webinar will introduce the concepts of recovery-oriented services to support providers in improving outcomes, enhancing efficiency and reducing costs. Event Description: This webinar is designed to help clinical staff learn effective counseling, engagement, and management techniques for working with patients who are receiving medication-assisted treatment (MAT). As an accepted evidence-based practice, MAT is now the standard of care for individuals with alcohol or opioid substance use disorders. The webinar will include guidance on identifying patients who are ready to commit to recovery, selection of appropriate medication protocol, patient engagement, team coaching and coordination, withdrawal management and induction, dosing, co-occurring disorders management, drug-drug interactions, persistence management, managed care interactions, and termination of medication. There will be focus on counseling patients using extended-release injectable naltrexone (VIVITROL®) enrolled in the FADAA/OSCA VIVITROL program. Participants should be prepared with at least one case involving MAT for discussion and analysis. There will be sufficient time for questions and answers. Event Description: In this workshop participants will learn skills which will enable them to more effectively engage persons seeking recovery in addictions counseling. Special emphasis will be placed upon effective outreach services for pregnant and parenting women, IV drug users, persons living with HIV and adolescents. A partial list of topics includes; engaging persons seeking recovery during outreach efforts within the first ten minutes of contact; facilitating engagement by viewing the entire community as the treatment center; stage based intervention strategies; strength based approaches to outreach and engagement; instillation of hope; overcoming resistance during outreach efforts.